This post provides a general background on fracking technology, the related environmental and safety concerns, and pending legislation. In an upcoming post, we’ll address the issues surrounding the vast Monterey shale deposit in California. 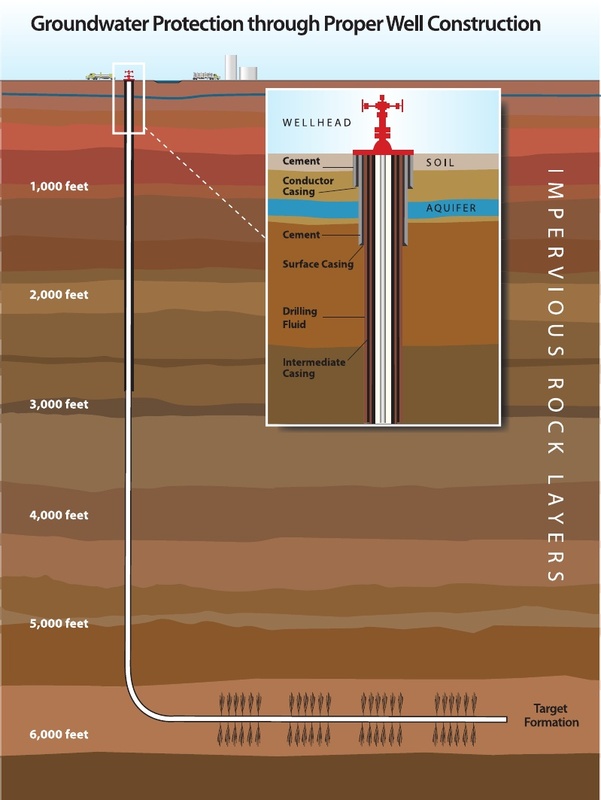 Induced hydraulic fracturing, or fracking, is a process in which a highly pressurized fracturing liquid is injected into cracks in rock layers. The energy within the pressurized liquid induces fractures in the rock layers to propagate and grow. The technology has uses in oil and natural gas industries principally because hydrocarbons that would otherwise be inaccessible or not economically viable can be extracted at much higher yield rates. The economic pros of hydraulic fracturing are obvious. The estimated global remaining reservoir of shale gas, tight gas, and coalbed methane, all recoverable via hydraulic fracturing, is roughly 310 trillion cubic meters. As of 2012, the total combined oil reserve of the top seventeen oil-rich countries totaled only 210 trillion cubic meters. Due in large part to hydraulic fracturing operations, current forecasts are that in late 2013, U.S. monthly crude oil productions are expected to exceed imports for the first time since 1995. 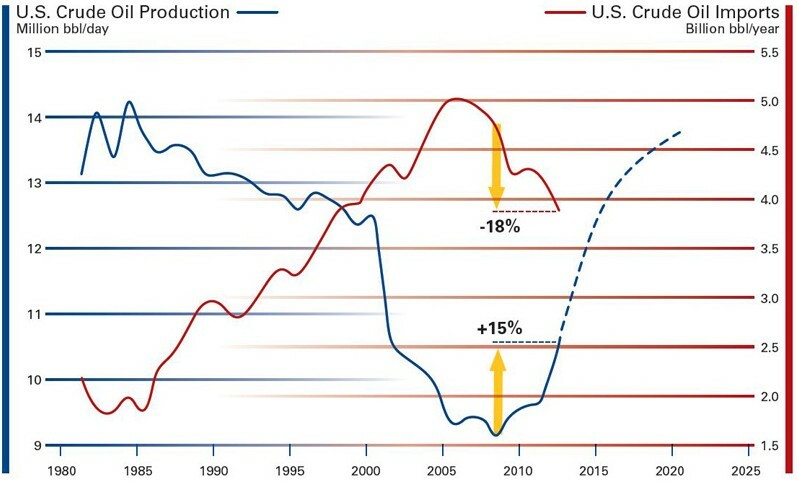 With global oil demand continually increasing, the vast supply of north American shale gas reserves is expected to provide the U.S. with substantially greater stability in an otherwise extremely volatile global market. However, obvious economic impacts aside, significant environmental and public health concerns have majorly delayed the proliferation of hydraulic fracturing technology. Chief among the concerns is a fear of groundwater contamination. Sought after shale deposits are typically located thousands of feet underground. Typically, the water table is at a depth of less that several hundred feet. This requires most fracking operations to penetrate shallow groundwater levels before reaching a depth where the shale deposits are located. To guard against groundwater contamination, fracking operations engage in a six step process: (1) wells are encased in thick cement, thereby preventing the fracking liquid or the flowback from mixing with the groundwater, (2) using a fracking liquid comprised of 90% water, 9.5% sand and 0.5% non-toxic chemicals, (3) fracking at a depth such that the groundwater and target formation are separated by thousands of feet of impermeable rock, (4) using back flow preventers designed to ensure that contaminated flowback is not mixed with water in supply wells, (5) storing waste water during fracking operations, and reclaiming it after operations conclude, and finally (6) recycling and reusing waste water after fracking operations conclude. Still, despite the safety precautions in place, hydraulic fracturing operations do not come without risks. Accordingly, the technology and it’s application has become a hotly debated and highly politicized issue. Presently, AB 7, AB 288, and SB 4 all relate to issues surrounding hydraulic fracturing. See the links corresponding to each bill for complete access to legislative history, analysis and the bills themselves. This bill would: (1) define, among other things, hydraulic fracturing and hydraulic fracturing fluid, (2) require an operator of a well to record and include all data on hydraulic fracturing treatment, (3) require the Division of Oil, Gas, and Geothermal Resources (DOGGR), in consultation with the Department of Toxic Substances Control (DTSC), the State Air Resources Board (ARB), and the State Water Resources Control Board (SWRB), on or before January 1, 2014, to adopt rules and regulations specific to hydraulic fracturing, (4) require an operator of a well to file a notice of intention to commence hydraulic fracturing treatment, (5) require the hydraulic fracturing to be completed within one year of the filing of the notice of intention, (6) require DOGGR, within 10 days of the receipt of the notice of intention, to make the notice publicly available, to post it on the division’s Internet Web site, and to notify the appropriate regional water quality control board (7) require the supplier of the hydraulic fracturing treatment to provide to the operator, within 30 days following the conclusion of the hydraulic fracturing, certain information regarding the hydraulic fracturing fluid, (8) require the operator, within 60 days of the cessation of hydraulic fracturing treatment, to post on an Internet Web site accessible to the public specified information on the fracturing and fluid, (9) require a supplier claiming trade secret protection for the chemical composition of additives used in the hydraulic treatment to disclose the composition to DOGGR, but would prohibit those with access to the trade secret to disclose it, and a person who violates this prohibition would be guilty of a misdemeanor. Because this bill would create a new crime, it would impose a state-mandated local program, and (10) require the supervisor, on or before January 1, 2016, and annually thereafter, to transmit to the Legislature and make available publicly a comprehensive report on hydraulic fracturing in the exploration and production of oil and gas resources in the state. This bill would: (1) define “hydraulic fracturing” and require the operator of a well, at least 30 days prior to any hydraulic fracturing operations, to file with the supervisor or the district deputy a written notice of intention, to commence hydraulic fracturing, (2) prohibit any hydraulic fracturing operations until written approval is given by the supervisor or district deputy and would require the supervisor or district deputy to notify the operator of the approval or denial of the notice within 10 working days after the notice is submitted, (3) require the supervisor, upon approval of the notice, to immediately notify the appropriate regional water quality control board, (4) provide that if hydraulic fracturing has not commenced within one year of receipt of the notice, that the notice shall be deemed canceled, (5) authorize the Division of Oil, Gas, and Geothermal Resources (DOGGR) to establish a reasonable fee to be paid by the owner or operator for the costs incurred by the department for the regulation of hydraulic fracturing operations, and (6) repeal the following provisions of Sections 3106 and 3203 of the Public Resources Code: (a) the supervisor is required to supervise the drilling, operation, maintenance, and abandonment of wells so as to permit the owners or operators of these wells to utilize all methods and practices known to the oil industry for the purpose of increasing the recovery of underground hydrocarbons, (b) the grant in an oil and gas lease or contract to a lessee or operator of the right or power to explore for and remove all hydrocarbons from any lands in the state is deemed to allow the lessee or contractor to do what a prudent operator using reasonable diligence would do, having in mind the best interests of the lessor, lessee, and the state in producing and removing hydrocarbons, including, but not limited to, the injection of air, gas, water, or other fluids into the productive strata, the application of pressure heat or other means for the reduction of viscosity of the hydrocarbons, the supplying of additional motive force, or the creating of enlarged or new channels for the underground movement of hydrocarbons into production wells, when these methods or processes employed have been approved by the supervisor, (c) there is no legal duty upon the lessee or contractor, or the lessee’s or contractor’s successors or assigns, to conduct these operations. This bill would: (1) define hydraulic fracturing and hydraulic fracturing fluid, (2) require an operator of a well to record and include all data on hydraulic fracturing treatment, including names and locations of all known seismic faults, as a part of the history of the drilling of the well, (3) require the Division of Oil, Gas, and Geothermal Resources (DOGGR), in consultation with the Department of Toxic Substances Control, the State Air Resources Board, and the State Water Resources Control Board, on or before January 1, 2015, to adopt rules and regulations specific to hydraulic fracturing, including governing the construction of wells and well casings and full disclosure of the composition and disposition of hydraulic fracturing, (4) require an operator to file with the supervisor or a district deputy, at least 30 days prior to the commencement of a hydraulic fracturing treatment, a notice of intention to commence hydraulic fracturing treatment, (5) require the hydraulic fracturing to be completed within one year of the filing of the notice of intention, (6) require DOGGR, within 10 days of the receipt of the notice of intention, to make the notice publicly available, to post it on the division’s Internet Web site, and to notify the appropriate regional water quality control board, (7) require the supplier of the hydraulic fracturing treatment to provide to the operator, within 30 days following the conclusion of the hydraulic fracturing, certain information regarding the hydraulic fracturing fluid, (8) require the operator, within 60 days of the cessation of hydraulic fracturing treatment, to post or cause to have posted on an Internet Web site accessible to the public specified information on the fracturing and fluid, (9) require a supplier claiming trade secret protection for the chemical composition of additives used in the hydraulic treatment to disclose the composition to DOGGR, but would prohibit those with access to the trade secret to disclose it, and a person who violates this prohibition would be guilty of a misdemeanor, and (11) require the supervisor, on or before January 1, 2016, and annually thereafter, to transmit to the Legislature and make available publicly a comprehensive report on hydraulic fracturing in the exploration and production of oil and gas resources in the state. This entry was posted in Energy, Legislation and tagged Energy, Fracking, Hydraulic fracturing. Bookmark the permalink.